Since the marriage of Prince William & Kate and the pouring of English sparkling wine at the couple's wedding last April, the home-grown product has become very fashionable. So much so that the wine press has made big claims for England's finest, claiming that it can match and even surpass the real thing across the channel in Champagne. There are of course factors in common between the Montagne de Reims and say the North Downs, chalky soils especially and the same noble grapes. But the Weald is colder and crucially wetter than the Mountain. 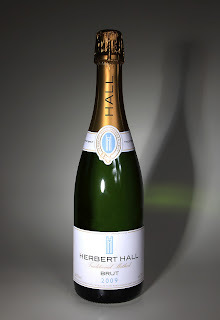 Combine that with the youth of English vines and there can be an austerity, sometimes even a coarseness, to our British styles that gives the best of Champagne by comparison a superior dimension of creaminess and supple balance. Or so I used to think until I tasted a remarkable Kentish sparkling wine the other day that had all the dash and verve of Champagne, but with a floral bewitching flavour that was a scented apple orchard in the glass - completely original, sui generis,as deliciously English as Elgar and, mixing my metaphors, cucumber sandwiches. Herbert Hall in Marden is the creation of Nick Hall who names his vineyard of 15 acres after his grandfather, Herbert, a farm tenant. I naturally warmed to Nick when last summer I sat next to him at a seminar at Hush Heath, a neighbouring fine Marden estate.We had come to hear the celebrated Austrian glassmaker Georg Riedal wax lyrical about his fine stemware. A very smooth bit of marketing, but the gilt came off the gingerbread when Georg in his high collared Franz Josef jacket said how much he disliked a particular glass because it did not highlight the fizz. No, it didn't: instead it allowed the excellent wine behind the bubbles to speak eloquently to the taster. I sighed, as did my neighbour, so I knew we would get on and share the belief that fine winemaking is as much about 'feeling' as oenological numbers. I wasn't then surprised to learn that Nick had read English at King's College, London and in a meandering career became a journalist, after trying other trades. Shades of my own rake's progress! He's married to a v successful solicitor with two kids, and in the early 'noughties he took the plunge and converted his farmland into a vineyard. Though a delightful lunch companion, Nick is no dilettante about wine. He took a thorough winemaking course at Plumpton and he seems to have done everything right in his debut vintage, 2009, a lovely ripe year. His recipe is the classic mix of Pinot Noir, Chardonnay and Meunier; 90 per cent of the organically grown grapes are squeezed gently in a modern Wilmes press, the remaining 10 per cent vinified in oak in order to aerate and strengthen the wine. Its originality lies in a subtle pinkish blush that heralds a lovely fruitiness and silken texture - truly a friendly vin gris that will please punters and connoisseurs alike. It's already listed at the Gavroche and is the pouring sparkling wine at Wilton's in St James. I will certainly pop a bottle with friends in Yorkshire, who happen to be called Middleton, over the holiday.